We get to meet so many inspiring women and men when Cycle Chic heads out into the world. 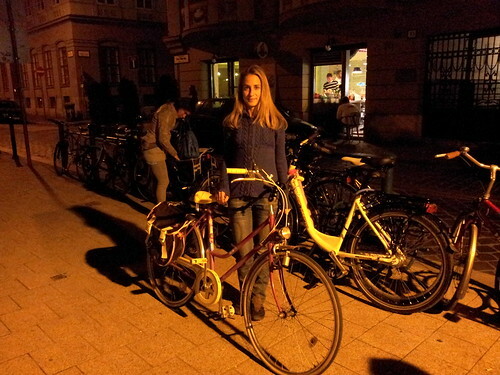 Not least in Budapest, on the occasion of the Cycle Chic Conference last week. Above is a wonderful and amazing lady. None other than Júlia Király - the Deputy-Governor of the Hungarian Central Bank. She rolled past the Bicycle Breakfast and we had a good chat about cycling in Budapest and Cycle Chic. What a role model Júlia is. Meanwhile, elsewhere in Budapest, we bumped into Rebeka Szabó outside a restaurant. Rebeka is an MP in the Hungarian Parliament for the Green Party. She was out for dinner with her partner - both on bicycles, of course. My kind of MP. Cycle Chic in a nutshell. 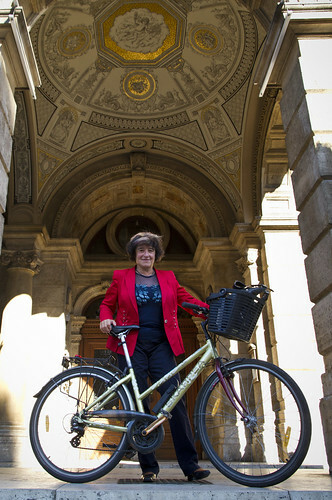 Regular citizen on a regular bike, contributing to the development of a liveable city.